White and sparkling teeth are the secret behind a beautiful and confident smile. Due to changes in our lifestyle, health condition, over consumption of tea or coffee and diet habits, we are losing the pearly white color of our teeth. People with yellow teeth feel embarrassed to smile in public places. In cosmetic industry, teeth whitening treatment restores the teeth color through laser bleaching, bleaching strips and bleaching pen. Now-a-days it has become a million dollar industry. If you are afraid of the bills, treatments and consulting a dentist, you can try simple home remedies to get rid of the yellow teeth. 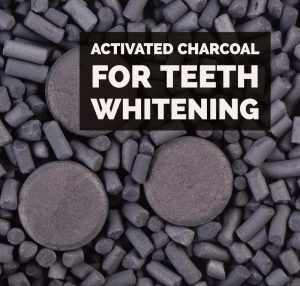 Let’s talk about charcoal for teeth whitening. Activated charcoal or activated coal (or carbon) is considered as the best way to whiten teeth naturally. It is a perfect, safe and effective alternative for teeth whiteners like tooth whitening trays, gels, strips which are toxic in nature. Regular usage of activated charcoal will not cause any damage to the tooth enamel and won’t delicate the gum tissue. Why is Charcoal Good for Teeth Whitening? We all know that charcoal is very effective in removing the impurities from the water but here are the reasons why is it effective in removing yellow stains on teeth. Charcoal’s natural adhesive qualities readily absorb tannins (staining culprits) such as tea, wine (especially red wine), coffee and plaque and thus clear away all these things when you spit it out. Charcoal is antibacterial and anti–fungal. It absorb the bacteria, toxins and heavy metals in the mouth to give brighter and healthier smile. Mix 1/4 teaspoon of activated charcoal with 1 teaspoon of your regular toothpaste. Use this mixture to brush your teeth as usual. Rinse with water and follow the process regularly. Mix 1/4 teaspoon of charcoal with 1/4 teaspoon of sea salt. Use this mixture to brush your teeth. Mix 1/2 teaspoon each of water and powdered activated charcoal. Swish this mixture in your mouth for 5 minute. Spit and rinse your mouth thoroughly. Do this at least once a day after brushing your teeth. Mix 1 tablespoon of coconut oil and stir in ¼ teaspoon of activated charcoal. Brush gently for 3 minutes using this mixture. Rinse with normal water until no charcoal remains on the teeth. For better results, include peroxide or colloidal silver. Mix equal quantities of activated charcoal and baking soda. Wet your toothbrush and dip it in the mixture. Brush gently for 2 – 3 minutes. One can easily find activated charcoal online in capsules, tablets or bulk food grade powder. Most of the people prefer activated charcoal capsules as they will naturally disburse in stomach more quickly than tablets. Capsules don’t have binding agents that are required for tablets so one can easily use capsules for home remedies. These capsules are readily available at online stores like Amazon, iHerb and many other websites. Apart from capsules, activated charcoal is also available in bulk carbon powder. Bulk powder has many positive reviews, would last long for months and is of great value. Yes, activated charcoal is safe to use for whitening teeth. It is a perfect alternative for chemical based teeth whitening gels and strips. To make activated charcoal, manufacturer heats the common charcoal in the presence of gas and this makes it very porous. These pores readily absorb stains, impurities from the teeth. They don’t trap or absorb calcium salts found in tooth enamel so it doesn’t cause any damage or sensitivity. Activated charcoal is a little abrasive so don’t force or put more pressure while brushing your teeth with it. How often you can use Activated Charcoal for Whitening Teeth? When you are using activated charcoal for teeth whitening, it is recommended to use once in a day for 3 days in a row. If you have deeply stained teeth, use it for 1 time a day for 5 days continuously. Then don’t do it for a few months. You can repeat this process leaving a few months gap. For best results, follow the advice below when using activated charcoal to whiten teeth. Use medical grade activated charcoal instead of regular charcoal. Charcoal helps to clear the stains on teeth but if your teeth are naturally darker or yellow, then you have to consult your dentist. Activated charcoal can stain clothing and surfaces. Always make sure to rinse your mouth as thoroughly as possible after using charcoal to brush. If used in excess, charcoal can damage tooth enamel with its abrasiveness. If you’re pregnant or nursing, consult a doctor before starting activated charcoal treatments. If your teeth or gums become irritated, stop using charcoal right away. Brush very gently when using charcoal. Ask a doctor if activated charcoal will interfere with medicines you are taking. Have you tried activated charcoal for teeth whitening? Let us know which methods worked best for you! Have you also tried other home remedies for teeth whitening such as turmeric? Share your experience in the comments section below.